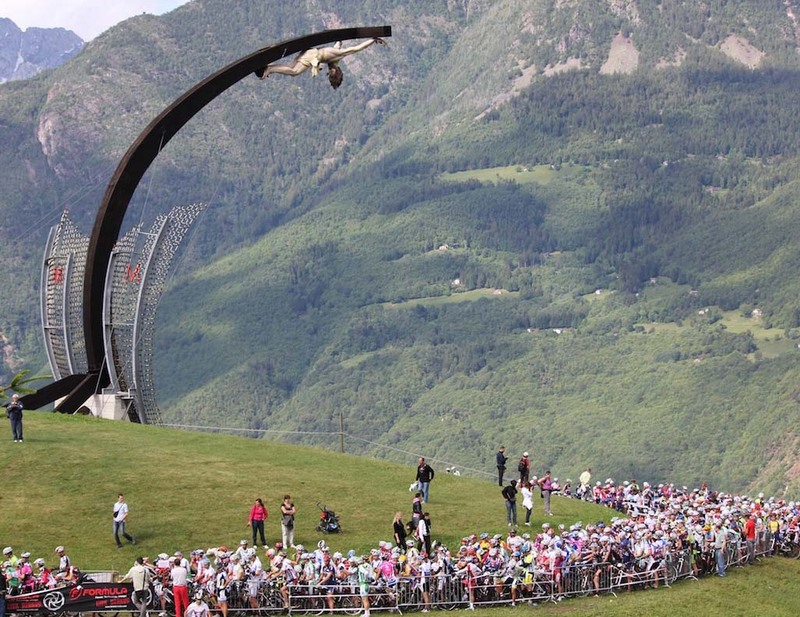 Pope John Paul II crucifix crushes man to death in northern Italy. This Catholic copy of the Messiah was not able even to save him self. An Italian man was crushed when the wooden cross toppled during the event near the Alpine village of Cevo in northern Italy, instantly killing Marco Gusmini, 21, on Wednesday. This Roman Catholic “Jesus” fell down and crushed a young Italian. “It is an inexplicable tragedy. A young life, so many hopes, destroyed this way,” Cevo mayor Silvio Citroni said. “The boys ran in every direction when they heard the sound of the wood splintering,” he said. Further celebrations to mark the pope’s elevation to sainthood have been cancelled. This event is another sign from heaven, that Roman Catholics must repent from their idolatry. Or face judgment and destruction. The Bible clearly forbid Jews and gentiles from shaping images of God. Still Roman Catholics shape images of saints, madonnas and “holy items”. 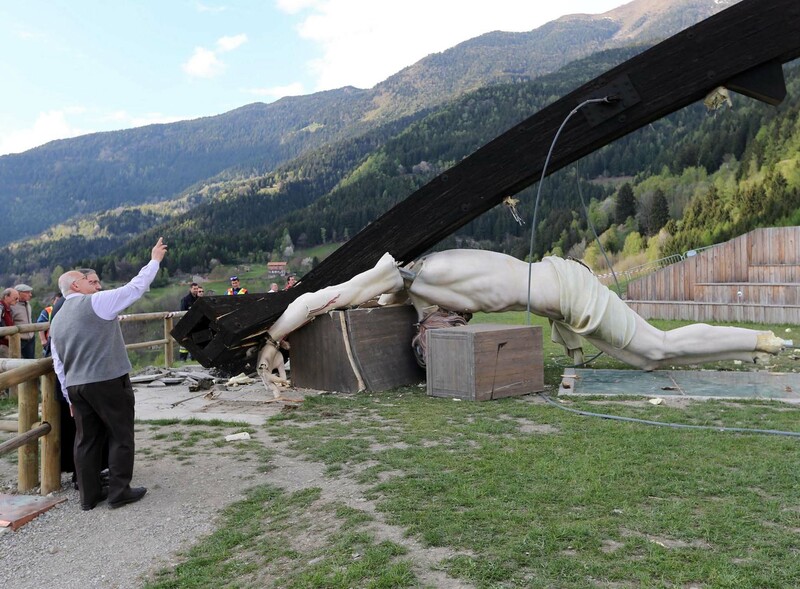 The great irony, is that a lifeless statue of Catholic “Jesus” fell down and crushed a man to death. This should clearly explain to all Catholics that statues that can not see, can not talk, can not hear, are lifeless idols. When this kind of “Jesus” fell down, the Word of God is fluffed. This kind of “god” could not even save it self from being crushed into pieces. The true and living Messiah, can not be confined into a piece of stone and wood. He is the living God, Yeshua (Jesus) the Messiah. Those who obey Him, worship Him in spirit and in truth. They love Him, and obey His commandments. To all Roman Catholics: Please repent, and leave this false and lifeless religion behind. Fall on Him, and be broken into pieces. It is surely to late, the day He falls on you and your are destroyed. Please remember: I loved you enough to tell you the truth. Just look at that second image. Doesn’t it look like a mockery of Jesus? Would a person who believes in Jesus who is alive and sits at the throne by his Father in heaven, create something as bizarre as this? There’s something devilish about this “art”. Some bloodthirsty warrior, would do this sort of thing to his enemy. The Lord Almighty does not play games, is serious about idols and sin. PGT ! Have not seen you around WND much. thanks for the present truth. Praise, Honor and Glory to Our Lord and Savior Jesus Christ.